Flight Education majors cover the knowledge and flight training needed for a professional pilot career, either in airlines, general aviation or the military. Flight training is conducted in late model Cessna aircraft. Hampton University offers Bachelor of Science (B.S.) in Flight Education degree program as well as the online program leading to the Associate of Science degree in Flight Education. 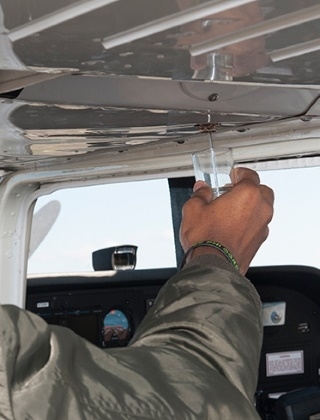 Flight Education students, upon completion of these programs, have a variety of pilot ratings and enter the job market prepared to seek employment as a pilot in the aviation industry. Students with these degrees can go to work in commercial aviation for a company like Continental Express or seek employment as a pilot in the corporate aviation field. Students in the Flight Education major will: 1) Have a strong liberal arts background; 2) Be able to effectively communicate through written and oral methods; 3) Have the FAA credentials of commercial pilot certificate and a flight instructor certificate so graduates can get an entry-level flying job; 4) Have an understanding of aircraft design standards, performance, operating characteristics, and systems; 5) Have established a culture and appreciation of aviation safety, including human factors and CRM; 6) Know how the aviation industry and the governing agencies are organized so graduates can navigate their careers; 7) Have the math skills to plan navigation, calculate aircraft performance, and other computations to insure a safe and efficient flight; 8) Have knowledge of legal and labor issues related to the aviation industry; and 9) Have knowledge and understanding of airspace and ATC so graduates can navigate efficiently, safely, and legally.